"A lava lamp?" The shop keeper glares at me. "Yes, do you have any?" I say looking around the small albeit tidy shop. "Yes we do. Small or big?" He gestures using his hands. I think about the limited money I have in my pocket. How much money did the shop keeper expect a eight year old boy to have I don't know. "Small." I say, feeling ashamed. He disappears under the counter for a while and comes up with one. It looks magnificent. The pinkish red lava inside, swam around freely and split into tiny bubbles exploding inside the limited place it had. It was fascinating and mesmerizing at the same time. I hold it tight in my hands and peep into it as though I'll swim into it the next moment. Tina was right, it did sooth the eye and the mind. The shop keepers harsh voice broke my fantasy spell. "Ninety rupees. You want it?" My heart sank. I thought about the fifty rupees that was safe in my pocket. It had taken me two whole months to save it for Tina's birthday. Tina was my elder sister and I wanted to surprise her with this lamp. She had seen one of it at her friends place and had never stopped talking about it since then. I very badly wanted to gift her one this birthday. "You have a smaller one?" I ask with a lump in my throat, placing the lamp carefully on the counter. "Hmmm..." The shop keeper grunts and disappears behind the counter again. I wait hopefully, crossing my fingers. Tina had been through a lot since the past two months and this would mean a lot to her. I tip toe and look at the shop keeper busy searching the lower drawers. Soon, he comes up with another one. "Here, this is the smallest we have." He lays it down on the counter with a thud. This one looked more brilliant and more like a kaleidoscope. It had multiple colors in at and as I turned it around the tiny beads hugged each other forming one giant miracle and swam gently along the waves rocking against the glass panel. The orange merged with the pink and the blue did with the yellow. I also found traces of purple in it and a hint of silver. I was transported to another world. My eyes gleamed at the sight of it and my lips broke into a wide smile. This is exactly what Tina would love. I feel the coins and notes in my pocket and I'm filled with a sense of loss again. Some how, putting up a brave face, I look up at the shop keeper. He seems fascinated this time. He smiles at me. "Who is this for?" He kneels down beside me. "My sister. She has always wanted one. Its her birthday today." I say clutching the lamp tight. "You want to surprise her? Is that why she is not here with you?" He asks. I feel a tear drop trickle down my cheek and I'm suddenly laden with emotions. My hands shiver breaking the lava inside the lamp into a million drops of light again. "She's had an accident. She can't walk." I say slowly. "Oh, then you must give this to her. Come, let me pack this for you." He gets up and takes the lamp from my hand. "But how much is this? I have only fifty rupees with me." I say, feeling ashamed again. He smiles and bends down to look into my eyes. "Its fifty rupees exact. Plus, you get a chocolate free with it. Pick anything you want." He says pointing towards the spread to my right and hiding the actual price tag behind his back. My face lights up instantly as I choose Tina's favorite chocolate and slip it into my pocket. The shop keeper packs the lava lamp in bright gold paper and even ties a bow around it. The smile on my face grew wider. "Here we go. Say 'Happy Birthday' to your sister from me. Will you?" He asks patting my head. "Sure. Thank you." I say happily. I empty my pocket of coins and crumpled notes on the counter. I hold the gift tightly in my hand and walk towards our home, the orphanage. Soumya...You have the gift sweetie! The sting they say is in the tail.But it is not sting here but a wonderful twist at the fag end.A touching finish to a great story. Thank you so much for the wonderful compliment KP! Beautiful! That's the word and that's the only word. 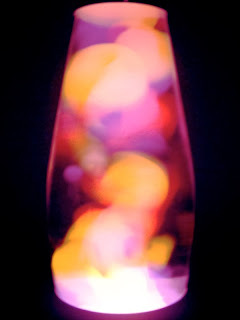 The way you described the lava lamp was so colorful and I loved it. This is seriously WOW!! Few posts stay with you for long and this one did. Beautiful, selfless love this is. This is so amazing, Soumya! It has touched my heart. How easily you were going to make a tear drop from my eyes (If I hadn't controlled myself)! Wow is the word.. the story, the narration.. it's incredible.. Touched my heart..